12 Interesting Facts About 'Jurassic Park' You Didn't Know! ‘Jurassic Park’ is perhaps the best-known and best-loved movie of all time. Bringing together dinosaur and man, the movie creates an enthralling and equally terrifying image of what it would be like if the two creatures were to co-exist. In fact, the movie had such a great impact on people that ever since, the number of students enrolling for paleontology courses in colleges has increased exponentially. If that’s not proof enough, I don’t know what is. However well-known the movie might be, there are still some bits of it you might not be aware of and you might be the biggest ‘Jurassic Park’ connoisseur there is. Here we present to you 12 mind-blowing facts about ‘Jurassic Park’! 1. According to NASA, Jurassic Park (1993) is the 7th most scientifically accurate film. 2. In the scene where the T-Rex breaks into the Ford Explorer in the movie, the screams were real; the glass was not supposed to break. 3. The seemingly unrealistic computer system in Jurassic Park does, in fact, exist. 4. The T-Rex’s roar in Jurassic Park combines the sounds of a baby elephant, a tiger, and an alligator, and its breath is the sound of a whale’s blow. 5. 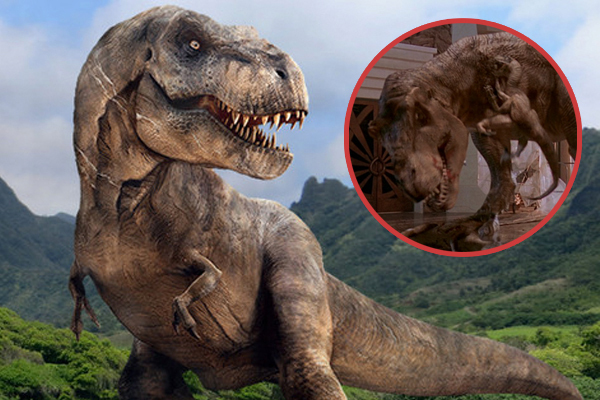 The T-Rex in Jurassic World is the same T-Rex from the end of the 1993 Jurassic Park movie; the scars on its side are from its fight with the velociraptors in the first movie. 6. It took 6 hours to capture one frame of the rain-soaked T-Rex in Jurassic Park. Previous article England’s Poison Garden Has Some Of The Deadliest Plants On The Planet. It’s Surreal. Next article Did A Floating City Really Appear In China? You Have To See It To Believe It!